The Pentagon has reassured allies of its “ironclad” security commitments, after President Donald Trump cancelled its Korean military exercises. Mr Trump made the announcement after historic talks with North Korean leader Kim Jong-un in Singapore on Tuesday. The cancellation is seen as a significant concession to North Korea. 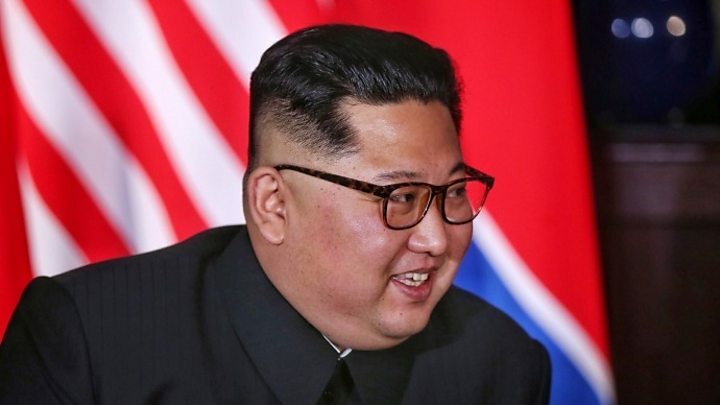 Mr Kim, in his first reported comments since the talks, said it was “urgent” to halt “irritating and hostile military actions against each other”. State media quoted Mr Kim saying that the two countries “should commit themselves to refraining from antagonising” each other “and take legal and institutional steps to guarantee it”. It also said Mr Kim had invited Mr Trump to visit Pyongyang “at a convenient time” and Mr Trump had also invited Mr Kim to visit the US. “The two top leaders gladly accepted each other’s invitation,” KCNA news agency added. How many dead US soldiers are in North Korea? The military exercises, often called “war games”, are held in South Korea with local forces and US soldiers stationed there. The Kim-Trump summit meeting – the first such talks between the two countries – centred on nuclear disarmament and reducing regional tensions. It concluded with a one-page agreement. In the press conference afterwards, however, Mr Trump added another announcement: the cancellation of the war games. He also said he wanted to bring US troops home – although he did not specify a timeframe. 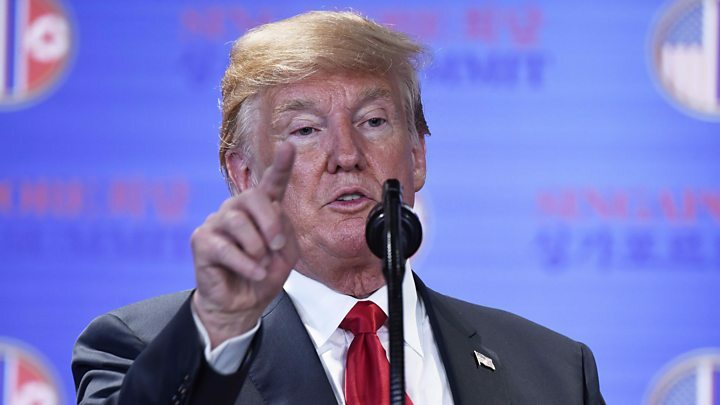 Mr Trump said the drills were “provocative” – even though the US has previously defended them – and there were suggestions that US allies in the region had not been forewarned of this move. However, the Pentagon has since denied that Mr Mattis was caught off guard. He was consulted ahead of time, said Pentagon spokesperson Dana White. How did South Korea react? Earlier, South Korea’s Presidential Blue House said it needed “to find out the precise meaning or intentions” of Mr Trump’s statement. South Korean President Moon Jae-in spoke by phone with Mr Trump for 20 minutes late on Tuesday, but an official readout of the call made no mention of military exercises, according to Reuters news agency. The US maintains around 30,000 troops in South Korea and once a year it brings in others – typically from its Pacific base in Guam – to join large-scale drills. Mr Trump said scrapping them will save a “tremendous amount of money”, but he added that they could be reinstated if co-operation from the North declines. 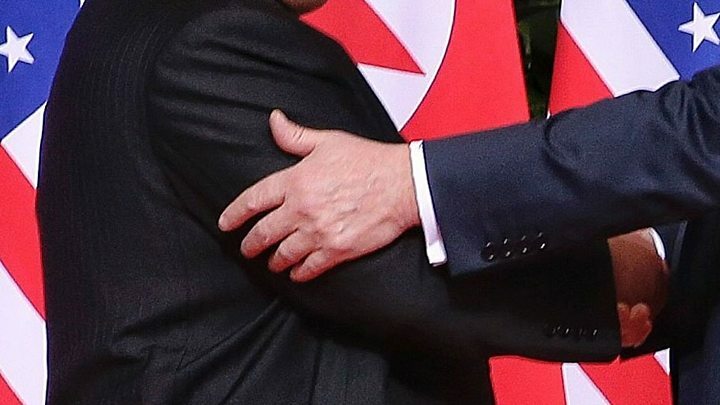 Mr Trump and Mr Kim – who traded vicious insults last year – gripped each other’s hands in front of US and North Korean flags. Mr Kim also “reaffirmed his firm and unwavering commitment to complete denuclearisation of the Korean peninsula”. How many dead US soldiers in N Korea? Who was Trump’s nuclear uncle? The US president said he had, and repeated his description of Mr Kim as “talented”. Two years ago Barack Obama travelled to Cuba – and was roundly denounced by conservatives for breaking bread with totalitarian leaders and praised by liberals for his statesmanship. Now, with Donald Trump’s summit with Kim Jong-un, the tables have been turned. Mostly. On conservative Fox News and among Mr Trump’s core supporters, the president was lauded for a historic diplomatic breakthrough. Among Democrats, there was more than a fair amount of concern that the president was engaging in a glorified publicity stunt with little chance of success. Republicans in Congress have been more measured. There was plenty of talk of “historic first steps”, in Senate Majority Leader Mitch McConnell’s words, but concern over how the yet-to-be negotiated verification details will turn out. A few other conservatives expressed dismay at seeing the US and North Korean flags side-by-side, and viewed Mr Trump’s solicitous manner and warm words for Mr Kim as too much, given his nation’s history of human rights violations. “Needless to say, we would’ve wrecked Obama for doing this,” tweeted conservative blogger Allahpundit. Tuesday was the latest reminder that in just 16 months, US – and international – politics have been turned upside down.